I’m jealous of how many of you people traveled so little over the weekend. Geetle, Pookie and I ended up travelling between 400-500 miles. Giggles and BAGM stayed home from the long trip (doctor’s orders) so they only logged about 100. The drive home on Saturday after the Festival of Lights was brutal. About 11pm, I had to stop at a gas station to stand up, get some coffee and try to wake back up. The kids were not happy when I made them wake up to follow me around the gas station but perked up when they were allowed to pick out a treat. I refuse to actually complain about the drive, though, because each year I get to go is another time I get to see my grandma which I don’t get to do as often as I’d like. 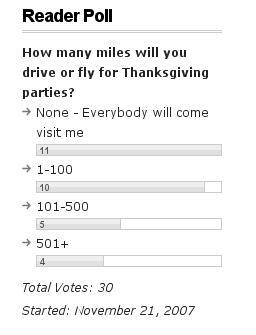 I’m not sure what I’m going to do about visiting the rest of my relatives in Peoria when we can’t all meet for the Festival at grandma’s house. I never get down there any other time of the year and will have to figure out another way to get down there and see a bunch of people in one trip. Now that Thanksgiving is over, it is time to think about Christmas. Have you bought your presents yet? Have you dropped enough hints to your spouse? Are your kids driving you crazy with constant additions to their Christmas list? This weeks poll question is how much money do you plan to spend on each kid. Vote in the sidebar and let me know your thoughts in the comments.